Mastika is a liqueur seasoned with mastic, a resin with a slightly pine or cedar-like flavor gathered from the mastic tree, a small evergreen tree native to the Mediterranean region. 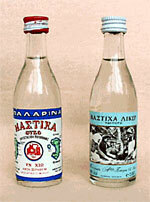 In Greece, mastika (Greek: μαστίχα) is a strong spirit similar to ouzo or tsikoudia. It is served cold or at room temperature but usually with ice. Both turn white (louche) when poured over ice or mixed with water, forming small crystals when frozen. They are served with various mezedes—appetizers such as octopus, salad, sardines, calamari, fried zucchini, and clams. Mastika often accompanies desserts made with almonds and is served at wedding feasts as a digestif. It has a sweet smell and flavor similar to liquorice. Chios Mastiha is not the same drink as mastika; it is a brandy-based liqueur native to the island of Chios, where mastic has traditionally been cultivated. In Bulgaria, mastika (Bulgarian: мастика) is a strong anise-flavoured drink, consumed chilled. Mastika is often combined with menta, a mint liqueur, to make a traditional cocktail called "cloud". According to Bulgarian law, mastika is an alcoholic drink with minimum 47% vol of alcohol, made of natural ethanol flavoured with anethole, extracted by rectification of essential oils from star anise, anise, fennel or other plant, containing the same aroma component with concentration at least of 2.5 grams per litre, sugar at least 40 grams per litre, with or without addition of mastic and/or aroma distillate and has specific organoleptic characteristics. In Romania, mastika (Romanian: mastícă) is used as a wedding toast and is thought of as a good accompaniment to traditional chicken dishes. ^ Наредба за определенията на видовете спиртни напитки, видовете суровини и технологични операции, правилата за производство на спиртните напитки, разрешените добавки и условията за използването им, ДВ бр. 68 от 2006 г.